Impolite Company was an official sponsor of the first annual Peekskill Film Festival in the quaint, nice town of Peekskill, NY. 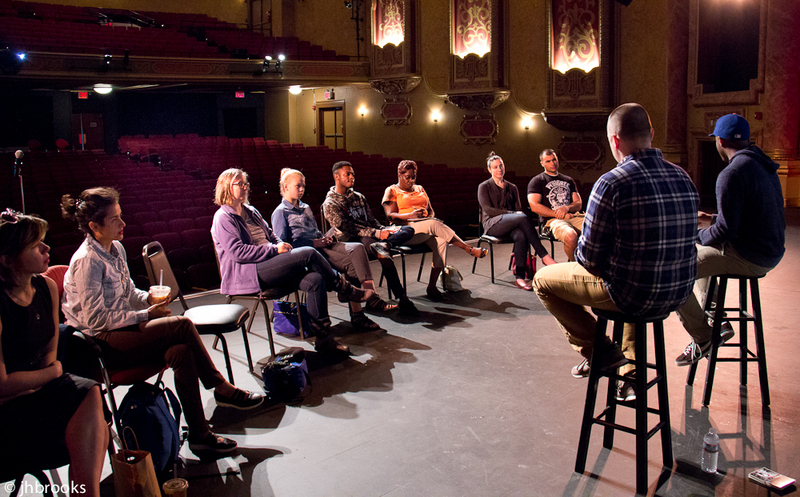 Ryan Carmichael and Jason Stefaniak led an intimate, insightful filmmaking workshop with the aspiring filmmakers and cinephiles of Peekskill. Impolite Company hopes to continue their support of the Peekskill Film Festival in the future. Thank you to James Brooks for these wonderful photos. It's important to share your knowledge and experiences with those coming up behind you. On March 30th, the But Not For Me team held a roundtable discussion at the NYU Production Lab with aspiring feature filmmakers, sharing our lessons from making the award-winning debut feature film. What's always great about these events - besides hoping the participants get something out of the info you share - is how much you get out of doing the sharing. At Impolite Company, we're big believers in doing what we can to make the world a better place. One of the ways we'd like to do that is helping children in the United States become more media literate. Media literacy is a must in our modern world. It makes for better citizens, and it makes for better humans. Until we build our capacity to do more, we wanted to point out the great work of REACT to Film, currently doing a TON to not only advance media literacy, but to use documentary films to teach social issues to young people and then galvanize them into action to do something about those issues. We aspire to do the good they're doing and we're inspired by their efforts! "Whatever affects one directly, affects all indirectly." It's simple: we have to help each other. It's our human obligation. It's a moral imperative. It's the right thing to do - and we accept that responsibility. We don't know exactly how we're going to do it yet - creating content for nonprofits or progressive political causes? mentoring young people struggling to find their voices? teaching visual storytelling to people of all ages? sharing our economic good fortunes? creating an artistic network that inspires and uplifts? - but we're going to do it. And we're going to share our efforts here. Because everyone can and should share whatever they can to help others. It doesn't matter what you have to share, just Don't Do Nothing.